The New Moscow Philosophy is the kind of droll satire that I really enjoy. It’s an overt parody of Dostoyevsky’s Crime and Punishment, but fortunately (since I read that too long ago to remember the details) the author Vyacheslav Pyetsukh has constructed his novel so that anyone can enjoy his dark humour, whether they’ve read or can identify the allusions to Dostoyevsky, or not. The novel is set in late Soviet-era Moscow, in Apartment 12 where numerous people are crammed into a space which was once home to just one family, of whom the elderly Alexandra Sergeyevna Pumpianskaya is now the sole surviving remnant. After what Russians call the Imperialist War (i.e. World War 1) ‘at the time of the so-called consolidation of the Moscow gentry and bourgeoisie’, the apartment was subdivided by soviet decree and the Pumpianskaya family ended up with only the dining-room. The rest of the apartment became home to a disparate group of people, who now form an uneasy kind of extended family, bound together by the intimacies of daily living at the same address and – over the years – a shared history of life under the Soviets. This arrangement allows for an interesting miscellany of characters. Belotsvetov and Chinarikov are the ‘intellectuals’: they engage in deep-and-pseudo meaningful conversations about almost anything but especially about the state of the nation and its relationship with literature. Fonervyakin is the eccentric whose collection of preserved fruits threatens to take over his room. Yulka Gulova is a divorcée with two children called Lyubov and Pyotr, and there is also a granny called Anna Kapitonova and her grandson Dmitry Nachalov. This younger generation do the usual irritating things that offspring do and provide opportunities to create discord, inconvenience and complaints. Then there is an aspiring writer called Valenchiik and his pregnant wife Vera; Vostryakova the building superintendent; and Vanya, the locksmith who turns up to break into Alexandra Pumpianskaya’s room when she goes missing. Because Alexandra Pumpianskaya is regular in her habits and has been housebound for many years, her absence had been noticed straight away. When the residents meet to discuss the mystery of her disappearance it transpires that someone has seen a ghost, that there was a mysterious phone call, that a threatening letter has been received, and – when the room is eventually opened, that there is a photograph missing from her wall and it seems that she had gone out, something she hasn’t done for ages. But suspicions of foul play also give rise to the inevitable question of what to do with Pumpianskaya’s room if she has been murdered. The extra space would be welcome for any of the residents, all of whom have eyed it off and are lobbying for it to be assigned to them. All of whom stand to benefit, therefore, from the old lady’s death. Belotsvetov and Chinarikov lack confidence in Rybkin the district inspector who responds to their call for police assistance, and so these two assign themselves the task of solving what they feel sure is a dastardly crime. Together they bumble around amassing clues of one sort or another and dream up all kinds of bizarre scenarios to explain the old lady’s disappearance. In between times they discuss philosophy, the dreadful state of Moscow society that neglects its elderly citizens and so on. While this neglect tends to be a universal concern in large cities where the elderly often lack care and support, the setting in Soviet society in the Glasnost period is a poignant foreshadowing of the social dislocation that seems to have taken place in the new Russia, a subject explored in Eva Hornung’s novel Dog Boy where the savages turned out to be people, not wild dogs. 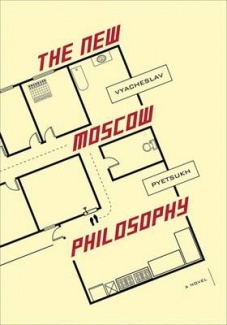 The ‘new’ Moscow philosophy that Belotsvetov and Chinarikov explore centres around Dostoyevsky’s novel and the relationship between life and art, and this is where my new-found knowledge about the significance of 19th century Russian authors became useful. During the 19th century under a succession of autocratic rulers, dissent and demands for long-overdue reform were effectively suppressed. But the great novelists – Tolstoy, Gogol, Turgenev and Dostoyevsky – were able to use literature to critique social and economic problems, and get away with it. This explains the high esteem in which these authors were held during the Soviet period and why Belotsvetov and Chinarikov explore in their discussions the importance of literature and its relevance to contemporary everyday life. Literature is the root of life, so to speak, if not life itself, only slightly displaced along the x-axis, and consequently it should come as no surprise that in Russia where life goes literature follows, but also that where literature goes life follows, that Russians not only write what they live but in part live what they write, that literature has such spiritual authority here. This is a terrific book, extremely interesting and also relevant to anyone trying to understand the adjustment Russians have had to make in a short period of democracy. It was Stu from Winston’s Dad who brought it to my attention – thanks, Stu! In one way, Tony, I wish I had too. But then in another, reading it as if I’d never read C&P (because it was so long ago), meant that I could judge whether it was necessary to read it or not. And so while I think anyone will enjoy it more if they’ve read C&P, it doesn’t spoil the novel if not. Lisa, Once again I am full of admiration at your plunges into Russia literature. But once again I have a couple of quibbles. The mis-spelling of TUrgenev is a mere typo; but the relation between Russ. lit. and the State is more complex than your gloss. Certainly in the 19c the literate educated (about 2% of the population) knew how to read a sub-text, but during Soviet times the ‘esteem’ in which, for example,Tolstoy and Dostoevsky were held was very selective.Tolstoy was officially denounced as a)religious and b) an aristocrat; but Lenin forgave him a little because he at least wanted to give his estates away. Dostoevsky was out of favour for most of the Soviet period. Of course, dissident intellectuals had their own views – but they had to keep them very private. Oops, of course Spell-check didn’t pick up that typo! I’ll fix it….Thanks, Judith! Thank you, Celestine. I was so sorry to read on your blog about the death of Ghana’s President. He sounds like a great man, and a role model for other leaders throughout Africa. I loved the characters, and I often found myself wondering…if I had to live cheek by jowl with a bunch of other people like that, would I eventually be able to come to some kind of accommodation and be able to get along the way they did? I also wondered whether the author was idealising the situation a bit.